It can be tough sorting through the hundreds of different makeup brushes out there. Here’s a guide describing the brushes you’ll need based on what you’re using them for, as well as a a description of brushes you might be totally clueless about! Bet you didn’t even know about this, but, yes, you do. It might be difficult to figure out if a brush is made of natural or synthetic hair. A crude way to determine this is that synthetic hair bristles feel more like plastic and are very smooth. Natural hair brushes, obviously, feel more like natural hair. They are made from animal hair. If you’re vegan or cruelty-conscious, not to worry, there are synthetic hair brushes that are manufactured to feel and behave more like natural hair brushes. Synthetic brushes can last you for years if you clean them properly. Natural hair brushes can last you forever, if you also clean them properly. It would be optimal if you washed your brushes after every use, but not everyone’s got the time. So, wash your brushes at least once a week. You can use specialized brush cleanser or just a gentle shampoo. Rinse them until the water runs clear. Gently squeeze the water out of them and reshape the bristles. Then lie the brushes flat on a towel to dry. You generally want to use synthetic bristles for cream or liquid formulas, like concealer. 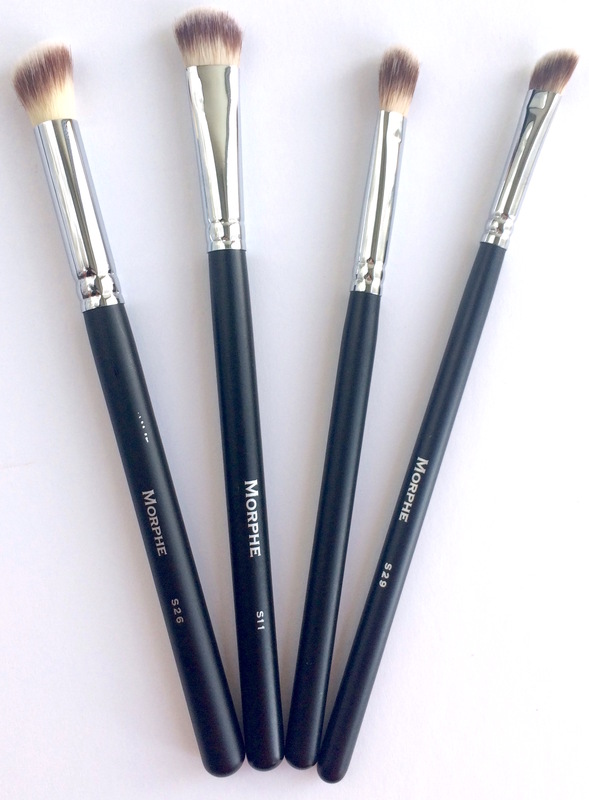 Synthetic brushes will allow for the creamy formula to slide of the brush and be deposited on your face. Use these for powders. The cuticle of natural hair (or synthetic natural hair) is made to hold on to the powder a little more strongly. Why is this good? It allows you to build up your coverage. Instead of depositing all of the powder on the brush, it will deposit only some of it. This is particularly good for blush or bronzer, where you want to avoid streaks. – Note: Whenever I say “natural hair” throughout this article, realize that I am implying the use of synthetically made natural hair brushes. Whatever you prefer! When looking at a brush, take into account the amount of bristles in the brush. If the brush is jampacked with little hairs, then it is very dense. Since there are more hairs in the brush, there are more hairs to grab onto your powder, blush, bronzer, or eyeshadow. Therefore, there is more powder on the brush to deposit on your face. You’re going to lay down more color than if the brush had fewer bristles. This is good if you want intense color. Brushes with fewer bristles will pick up less color and, thus, deposit less color. These allow for more layering. You’ll usually need both kinds. For example, you’ll use a densely packed brush to lay down an eye shadow on your lid. You will probably find that the edges where you laid down shadow looks jagged. Not very pretty. Grab a less dense brush and use it to blend out the edges of your shadow. Synergy, people. Synergy! For a powder that’s going to go all over you face, like foundation or setting powder, you’re going to want any kind of big, round, fluffy, natural hair brush. This will give your an even, light to medium coverage. If you want heavier coverage, such as if you’re only using a powder foundation, then you might want to get a buffing brush. This brush is large, but the bristles are shorter and more dense. The brush might also be flat, instead of rounded. This increases the amount of pigment being placed onto the skin. Freaked out about what a kabuki brush is? It’s a foundation brush without a handle. It’s a little tiny stub. It’s great for travel, but can sometimes be a pain during application, because you need to use your whole arm when blending powder over your face. A longer handle allows you to simply flick and swirl your wrist. Again, just a matter of personal preference. For blush, you have two variations from which to choose. My general rule for blush is to use a slightly smaller version of your foundation/setting powder brush. Why smaller? You don’t want blush all over your face! A brush with a smaller diameter will give you a little more control in the placement of your blush. Another option for blush is an angled contour brush. It looks like a fluffy powder brush that someone shaved into an angle. This give your just a little more control in blush placement, particularly if you’re someone who’s more advanced and likes to do some contouring with your blush. If you have no idea what I’m talking about, then just stick with a regular blush brush like I previously described. Hey, even if you’re a makeup pro, you might not even like an angled brush for blush. This is a little more personal preference than anything else. You can use the same principle here as you did for blush. You can use a fluffy brush or a contoured one (like the blush one seen above). Unless, of course, you like to put bronzer all over your face, then you can use a brush as large and fluffy as your foundation brush. If you use bronzer, or something like it, to contour your face (if you have no idea what I’m talking about, skip this next part. Not to worry!) then you’re going to want a more densely packed brush with a contour. This will allow you to lay down more pigment to get that chiseled effect. A contoured brush also helps you see where you’re placing color. Again, this is a little more personal preference. Try both and see what works for you. Here’s where things get tricky. There are dozens and dozens of brushes for eyeshadow alone. Here are some of the basic shapes/styles to help you better discriminate amongst the veritable jungle of eyeshadow brushes out there. This brush is flat and wide so that you can cover your entire lid with color. The bristles are dense, so you’ll be placing a lot of pigment on the lid. They don’t blend very well. That’s okay, because usually the lid shade is the lightest shade (aside from a highlighter) that you’re going to use. All the darker colors you’ll use elsewhere around the eye will go on top of this, so you’ll be able to blend and disguise any jagged looking edges on your lid. This brush is what you’ll use to put a color that’s darer than your lid shadow into your crease. It should be fluffy, round, and less dense than the on you used on your lid. This brush should have a tapered or rounded end to them. The longer the bristles of the brush, the less dense it will become. Short hairs will place more color. Longer-haired brushes that are less dense are more easy to use and blend. If you’re more advanced and/or want stronger, more dense color in the crease, you a domed brush with short hairs. A blending brush is basically just like your crease/dome brush, but it has to have longer bristles and be less dense. This brush is used without any eyeshadow or other product on it. After placing one color on your lid and another color in the crease (and you might have other colors too, see my article on eyeshadow placement. Soon to come! ), then you’re going to use this brush to blend everything so it looks more seamless. Swipe it back and forth in the crease until things look good to you. You’re going to use a smudge brush to blend (or smudge!) cream, gel, or powder liner. This is a flat brush with very short, dense bristles. It’s usually slightly tapered, so as to avoid harsh edges that can drag against your eye. These are great when creating the ever-loved, yet ever-difficult-to-master, smoky eye. This brush is a little too large to DRAW eyeliner onto your eye. It’s usually used without product to blend and smudge. You can add a little shadow on the brush to blend over already existing eyeliner, but don’t draw liner on with this. Take my word for it. This brush is fluffy, about medium density, and helps if it’s slightly angled. Having an angle helps see where you’re placing the highlight shadow on your browbone. You can easily use any light, fluffy brush for this, though. You can also use it to place shadow on the lid or crease. It really depends on how dense the bristles are. You’ll often see this brush included in sets, so that’s why I’ve included this kind of broad description here. For this one, you put the brush at the base of the lashes and push the liner into it. It can also be used to waterline (painting eyeliner onto the skin UNDERNEATH your top lashes and the skin above you lower lasehs. Yes, it tickles, but it looks great!). This brush is probably the easiest to use. Just lay it at the base of your lashes, and drag it in little stroke-y motions from the inner corner of the eye to the outer corner. This brush is the hardest to use, because it will reveal a shaky hand. You use it most like a pencil, drawing the liner along your lash line. The handle is either straight, or angled. They work the same. Some people just find the angled handle to be more ergonomic. Your choice! Next Next post: Eyeshadow Palettes: How to use those 2, 3, 4, or 5 colors!